Mother’s Day is a time of commemoration and celebration of moms everywhere. It is a time for family gatherings, dining out, and precious gift giving to show mom how much you care. The Lake Geneva area has many fabulous ways to celebrate mom by dining out, getting crafty, enjoying a show, or getting adventurous. Celebrate Mothers at Grand Geneva Resort & Spa. The Mother’s Day Brunch will be served in both Geneva ChopHouse and the Maple Lawn Ballroom. Treat Mom to a delicious brunch featuring omelet and pasta stations, assorted meats and salads, fresh fruit trays and a sweets table with a chocolate fountain. With your meal, each Mom will receive a gift in honor of her special day! Delight Mom with a divine brunch featuring hot, cold, and omelet stations, breakfast specialties and a dessert table. Enjoy delicious dining at The Abbey Resort. Treat Mom to a champagne brunch that features eggs Benedict, French toast, an omelet station and more! Enjoy a scrumptious brunch featuring Garde manger displays, sides, salads, a seafood bar, breakfast specialties, omelet and waffle bars, a grand pastry table, confections, and more. Reserve your seats early for the popular Mother’s Day Buffet in the historic 1894 Clausing Barn. After a scrumptious meal, enjoy a day in the Old World Wisconsin historic areas. All mothers get in FREE to the site on Mother’s Day! Give back to Mom by surprising her with a champagne brunch! All adults receive a complimentary glass of champagne; all children receive a complimentary glass of milk. Spoil Mom with a decadent brunch with apple and egg pancakes, eggs benedict, prim rib, swordfish steaks and more. After you’ve served Mom breakfast in bed, you’re going to deserve a break, too. Treat that special lady to a gourmet day at the Hunt Club’s charming farmhouse. Chef Ryne has designed a sublime three-course Mother’s Day menu and includes an array of favorited standard menu items as well. Work up an appetite on the course, as ladies golf free at Geneva National May 8 with a paying adult! Moms enjoy the Zip Line Canopy Tour at 50% OFF when participating with their family! Take Mom out for nature hikes, boating, archery, farm animals, tower climb, high ropes, camp store, animal encounter, creation experience, and a family photo shoot. Cost includes breakfast, lunch dinner and most activities. Mother’s play for FREE when accompanied by a regular price adult. Take Mom out for a meal, a horse show and an exotic bird show. Have a little adventure with Mom! Moms enjoy the Zip Line Canopy Tour at 50% OFF when participating with their family! Mother Nature on Mother’s Day—what could be better? Bring your mother and join experienced birders to explore some of the best Mother Nature offers at Price Park Conservancy. We welcome all resort and dining guests to join us as we serve up Mother’s Day with plenty of fun family activities in our Sandbar room and on the Harbor Lawn! Mother’s Day is that one special moment where we all take time to recognize the wonderful contributions of the great women in our lives… the hours and days of their lives dedicated to loving and caring for their children, husbands and families. Say thank you with an elegant Legends & Love Songs Brunch and Show at Rosewood! You can paint, we will show you how. Our resident artist, Kathy Jackson, will walk you through all the steps necessary to create your work of art. Everything is included, paint, a 16 x 20” canvas, and a glass of wine to loosen your creativity! And special for Mother’s Day, we will have a light appetizer buffet. Celebrate the remarkable women of Geneva Lake while taking a voyage with the Lake Geneva Cruise Line to Black Point Estate, an 1888 Queen Anne Victorian lake “summer cottage.” This narrated boat tour will focus on many of the remarkable women that have lived along the Shore of Geneva Lake. The event includes a first floor tour of Black Point and a presentation on the remarkable women of the Estate. Tea and finger sandwiches will be served on the return cruise. Take the lady in your life to a wonderful performance of MAGIC, COMEDY and ILLUSION this Mother’s Day. Great for the entire family! Performances at 5:00 and 7:00 Sunday, May 8. 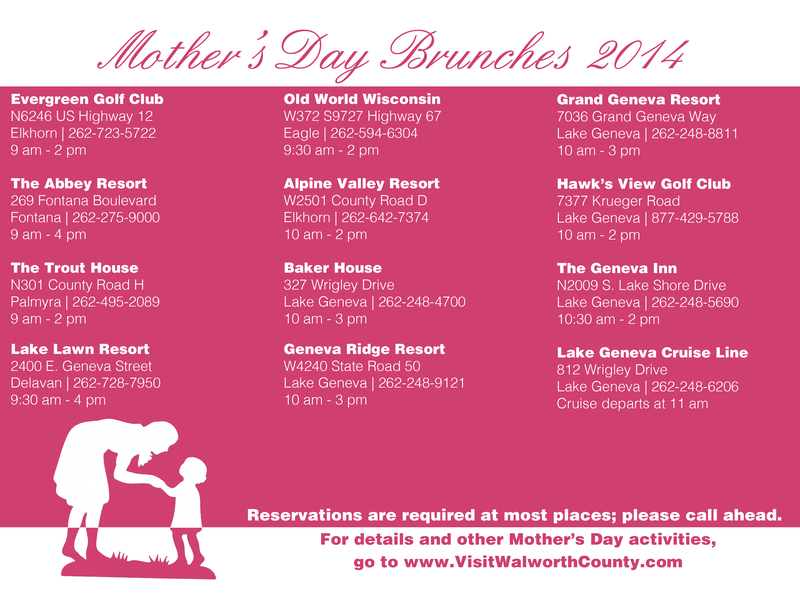 For details on these activities, and to find other fun and fabulous things to do with Mom in the Lake Geneva area, visit www.VisitWalworthCounty.com. Easter is right around the corner and Peter Cottontail will soon be hopping down the bunny trail! Walworth County has many fun, local Easter egg hunts, and we have a list of them all right here. Now the tough part: choosing one or two…okay, maybe three! And if you think the egg hunting fun is only for adults, you are mistaken. There’s a special egg hunt just for adults on the Walworth County calendar this year, too! Happy hunting! We love this time of year…people are emerging from their homes after a long winter, flowers are blooming, and fresh food is abundant! If you love fresh food as much as we do, you’ll love the farmers markets throughout Walworth County. Many communities offer a great market – and with varying days & times, you’re sure to find one to fit into your busy schedule. We know that sometimes, you don’t want to do to the cooking – but you want to enjoy fresh food. For restaurants offering locally grown food, try Pier 290 in Williams Bay, The Black Sheep in Whitewater, or The Trout House at Rushing Waters Fisheries. Some of our local attractions, offer special “farm fresh” dinners on select dates for a limited number of guests (Yuppie Hill Poultry, Staller Estate Winery). Visit their websites for details. Looking for more Farm Fresh options? Visit our website! Each child will receive a bag of candy and a small prize. There will be coloring pages, face painting and temporary tattoos for the kids as well. Please bring your own camera for photos with our Easter Bunny. Click For Details. Rain or shine – hunt will be held indoors (gym) if inclement weather. Bring your own camera for pictures with the Easter Bunny! Click For Details. Please bring a canned good or toiletry item to support Love Inc. Children ages 0-11 are invited to hunt for over 12,000 eggs! – completely FREE! Parents can warm up with hot drinks at the Athletic Pavilion. Meet and Greet with Easter Bunny. Click For Details. Ages 1-10 years. Bring your own container to gather eggs and join us for fun in the park! Come meet Mr. and Mrs. Easter Bunny. 3000 Eggs Stuffed with candy and prizes. Click For Details. Located at Genoa City Retirement Home. Advance registration is requested. Please call (262) 279-3211, if there is no answer please leave a message with your name, child/children’s name(s), age(s), and your number. Click For Details. 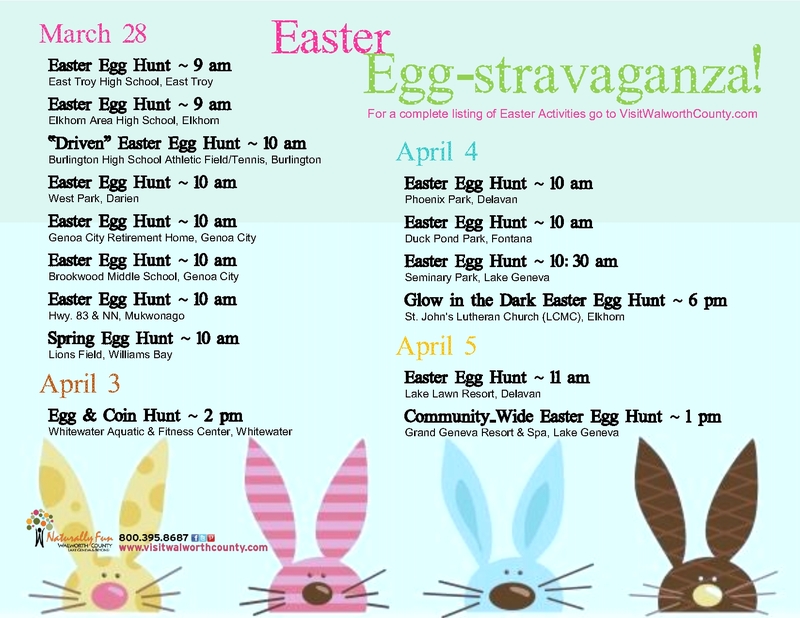 Easter Egg Hunt – Free – 10 am registration. Click For Details. The Mukwonago Lions Club is proud to present the annual Easter Egg Hunt for the enjoyment of the children of our local communities. Click For Details. Join the Williams Bay Rec Department and a special bunny guest at Lions Park for games, crafts and our annual Egg Hunt. We will have eggs, candy, prizes and games for ages 0-12! Click For Details. Search for eggs and coins in our pools! Exchange eggs for a treat bag and keep any coins you find. Click For Details. The Easter Bunny will be there. Ages up to 9 years old. Click For Details. Fontana Easter Egg Hunt will be at Duck Pond Park. The hunt starts 10:00 AM sharp when the Easter Bunny arrives. Parking fills fast, so arrive a little early. Click For Details. The age groups are 0-2 (with or without help), 3-4, 5-7, and 8-10. Jaycees members hide over 4000 eggs in the park for the kids. Eggs are filled with candy. The Easter Bunny will be making a surprise visit as well! Click For Details. A Glow in the Dark Egg Hunt on Saturday, April 4th following our 5 p.m. service. It is free and open to kids 6th grade and under. Click For Details. Join Como Community Church for their Easter celebrations on Easter Sunday, including an Egg Hunt – Click For Details. For brunch & resort guests only. Children gather on the Harbor Lawn Patio before each hunt. Click For Details. *Pint-size Easter Egg Hunt, designed for children 4 and under – Click For Details. For brunch & resort guests only. The Easter Bunny will kick off Lake Lawn’s annual Easter egg hunt along with his special helpers at 11 a.m. The Easter Bunny will stick around for a meet-and-greet from noon to 4 p.m. with plenty of photo opportunities for families. Click For Details. The Grand Geneva will host an Outdoor Community Wide Easter Egg Hunt on Sunday, April 5th, 2015 at 1pm. All children 10 and under are welcome (with their parents/guardians of course!) Bring your baskets to collect the eggs. Click For Details. Start a new tradition this Easter and celebrate with your family at one of these great restaurants in Walworth County! Enjoy a delicious brunch with all the typical breakfast & lunch offerings; some even serve a special beverage with your meal. Many resorts are offering fun family-friendly activities throughout the weekend, as well as overnight packages. Check out the full list of events happening this weekend on our Events Calendar, and locate specials on our Specials page! Brunch will be served buffet style; enjoy all the traditional brunch favorites – including omelet station, flat iron pork, pasta station, and an extensive sweets table. Join us for a delicious all-you-care-to-eat Easter buffet, with a carved prime rib and omelet station plus a wide spread of fruit, salads, breakfast items, and more. Enjoy a huge spread of brunch favorites at this holiday buffet. Complimentary sparkling wine & mimosas. Call now for reservations! The restaurant will be served chef-carved prime rib and ham, eggs & omelets made to order, lasagna, beef stroganoff, and more! Champagne brunch will be served in the Frontier Restaurant. Overnight packages are available for families looking to take advantage of the weekend festivities! Celebrate Easter with us; we have all of your favorite foods – from the omelet station to carved ham and beef tenderloin and so much more! Experience brunch at the most decadent mansion on the lake, with flowing bottomless champagne and mimosas. 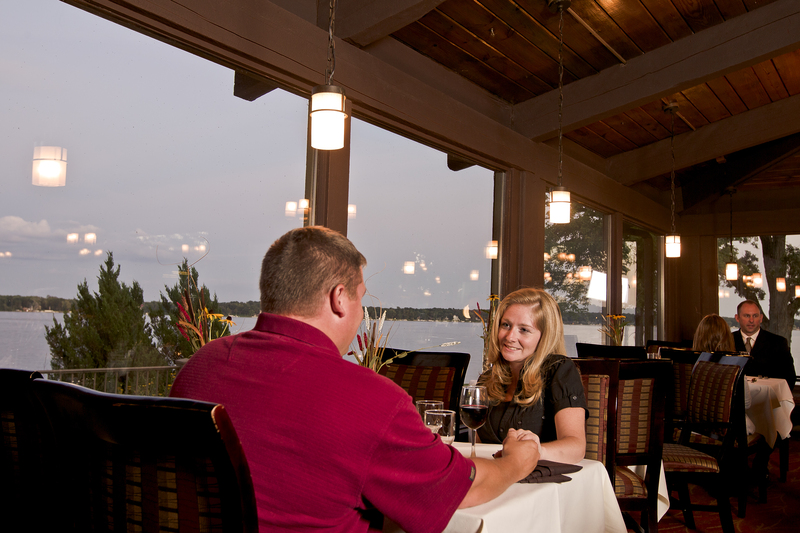 Amazing views of the lake & great company – call now for reservations. Make your plans for Easter Brunch at the Geneva ChopHouse. Sunday April 5th from 10am until 3pm enjoy all of your Easter favorites and more plus complimentary Champagne! Reservations are required, please call (262) 249-4788 to reserve your spot today! Easter brunch is longstanding tradition in many families, and for those who like to enjoy a truly decadent spread, there’s nothing like letting someone else do the cooking. Come let us serve you as you relax at our Sunday Brunch while enjoying the company of family and friends this Easter Sunday. We offer both a la carte selections as well as a complete four course brunch that starts with a glass of champagne. All at only restaurant in Lake Geneva located directly on shores of Geneva Lake with panoramic view of the lake! Pricing as listed on the menu. Come join us at PIER 290 on Easter Sunday and enjoy brunch specials, good service and the refreshing views of Lake Geneva in the Spring! The Hunt Club is offering a special three course menu for Easter Sunday, or choose items from a limited menu. Reservations are recommended. Mother’s Day is right around the corner – are you prepared? While we believe that we should appreciate our mothers every day, May 11th is “the big day.” Whether you are taking her for a scenic cruise, a hearty brunch, or enjoying the many other activities going on in the area, make sure you tell your mom what she means to you. We’ve done all the hard work for you & gathered up the area’s Mother’s Day events…all that’s left for you to do is choose one (and make the reservations)! Several stations, including spring garden, iced seafood, classic breakfast selections, chef carved meat, and various entrees, will be available for our Mother’s Day brunch. Complimentary champagne pour and cut flowers for mothers! The buffet will offer traditional items and made to order items, plus a Bloody Mary & champagne cocktail bar. Seating is limited. Mother’s Day Brunch has all of Mother’s favorites including a chilled seafood bar and variety of tempting salads, chafing dish creations, and more. Last seating at 3 pm. Every mother gets a complimentary flower and glass of champagne! Relax over a tasty brunch buffet served in the 1890s Clausing Barn, then stroll through the village and farmsteads. All moms receive free admission to the museum on Mother’s Day. Alpine Valley Resort is pleased to offer a traditional Sunday brunch for Mother’s Day. Plus – come for brunch, stay for golf! Only $37 plus tax for 18 holes of golf, including cart. Experience the most decadent mansion on the lake, with flowing bottomless champagne and mimosas, Eggs Benedict made to order, signature Banana Foster french toast, and all traditional breakfast foods. The chefs at Geneva Ridge have an extensive menu prepared for this Mother’s Day brunch, with all the traditional items plus chef carving stations and chef prepared seafood crepe station! Treat Mom to brunch at Grand Geneva this Mother’s Day; dine in the Grand Ballroom featuring entertainment from the Badger High School Choir. Take your mother out for a delicious three course champagne brunch with a Grandview! Light menu also available. Mother’s Day dinner will be start at 5 pm. Enjoy a lavish brunch buffet and scenic narrated boat tour of the entire lake aboard the Grand Belle of Geneva. Our first brunch of the 2014 season celebrates Mothers with a special gift! Hosted by the men of the parish in honor of all women! All parish members invited to attend. Moms play free when accompanied by a regular priced adult. Valid May 10-11. Celebrate Mother’s Day weekend honoring the remarkable women of Geneva Lake while taking a voyage with Lake Geneva Cruise Line to Black Point Estate, an 1888 Queen Anne Victorian lake “summer cottage.” This narrated boat tour will focus on many of the remarkable women that lived along the Shore of Geneva Lake. Mimosas and chocolate covered strawberries will be served on the Veranda before returning to the boat. Cruise will depart on May 10 & 11 at 2 pm. Join Grandview Restaurant on Saturday, May 10th at 3 pm for a scenic afternoon tea, with delicious sweets and savories. Just $30/adults and $15/children under 10; reservations are required. Mothers will receive a “complimentary dessert” when dining in Little Italy on Mother’s Day; for dine-in only. Open 4-9pm for dinner on Sunday, May 11. Celebrate Mom with a canopy tour on Mother’s Day – all moms receive a special 50% discount & FREE Lake Geneva Canopy Tour t-shirt, while supplies last. Call to schedule your tour today.